WB: Rat heart tissue lysate. Human brain tissue lysate. HEK-293 and HepG2 whole cell lysate. Our Abpromise guarantee covers the use of ab80039 in the following tested applications. WB Use a concentration of 1 µg/ml. Detects a band of approximately 62 kDa (predicted molecular weight: 62 kDa). Catalytic subunit of AMP-activated protein kinase (AMPK), an energy sensor protein kinase that plays a key role in regulating cellular energy metabolism. In response to reduction of intracellular ATP levels, AMPK activates energy-producing pathways and inhibits energy-consuming processes: inhibits protein, carbohydrate and lipid biosynthesis, as well as cell growth and proliferation. AMPK acts via direct phosphorylation of metabolic enzymes, and by longer-term effects via phosphorylation of transcription regulators. Also acts as a regulator of cellular polarity by remodeling the actin cytoskeleton; probably by indirectly activating myosin. Regulates lipid synthesis by phosphorylating and inactivating lipid metabolic enzymes such as ACACA, ACACB, GYS1, HMGCR and LIPE; regulates fatty acid and cholesterol synthesis by phosphorylating acetyl-CoA carboxylase (ACACA and ACACB) and hormone-sensitive lipase (LIPE) enzymes, respectively. Regulates insulin-signaling and glycolysis by phosphorylating IRS1, PFKFB2 and PFKFB3. AMPK stimulates glucose uptake in muscle by increasing the translocation of the glucose transporter SLC2A4/GLUT4 to the plasma membrane, possibly by mediating phosphorylation of TBC1D4/AS160. Regulates transcription and chromatin structure by phosphorylating transcription regulators involved in energy metabolism such as CRTC2/TORC2, FOXO3, histone H2B, HDAC5, MEF2C, MLXIPL/ChREBP, EP300, HNF4A, p53/TP53, SREBF1, SREBF2 and PPARGC1A. Acts as a key regulator of glucose homeostasis in liver by phosphorylating CRTC2/TORC2, leading to CRTC2/TORC2 sequestration in the cytoplasm. In response to stress, phosphorylates 'Ser-36' of histone H2B (H2BS36ph), leading to promote transcription. Acts as a key regulator of cell growth and proliferation by phosphorylating TSC2, RPTOR and ATG1: in response to nutrient limitation, negatively regulates the mTORC1 complex by phosphorylating RPTOR component of the mTORC1 complex and by phosphorylating and activating TSC2. In response to nutrient limitation, promotes autophagy by phosphorylating and activating ULK1. AMPK also acts as a regulator of circadian rhythm by mediating phosphorylation of CRY1, leading to destabilize it. May regulate the Wnt signaling pathway by phosphorylating CTNNB1, leading to stabilize it. Also has tau-protein kinase activity: in response to amyloid beta A4 protein (APP) exposure, activated by CAMKK2, leading to phosphorylation of MAPT/TAU; however the relevance of such data remains unclear in vivo. Also phosphorylates CFTR, EEF2K, KLC1, NOS3 and SLC12A1. The AIS (autoinhibitory sequence) region some sequence similarity with the ubiquitin-associated domains and represses kinase activity. Phosphorylated at Thr-183 by STK11/LKB1 in complex with STE20-related adapter-alpha (STRADA) pseudo kinase and CAB39. Also phosphorylated at Thr-183 by CAMKK2; triggered by a rise in intracellular calcium ions, without detectable changes in the AMP/ATP ratio. CAMKK1 can also phosphorylate Thr-183, but at a much lower level. Dephosphorylated by protein phosphatase 2A and 2C (PP2A and PP2C). 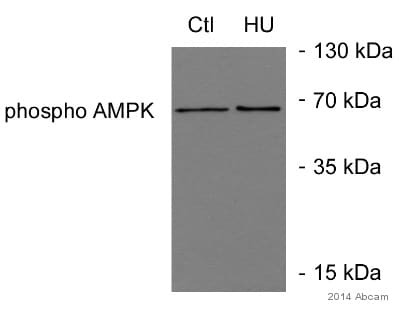 Phosphorylated by ULK1 and ULK2; leading to negatively regulate AMPK activity and suggesting the existence of a regulatory feedback loop between ULK1, ULK2 and AMPK. Cytoplasm. Nucleus. In response to stress, recruited by p53/TP53 to specific promoters. Additional bands at: 75 kDa, 80 kDa. We are unsure as to the identity of these extra bands. 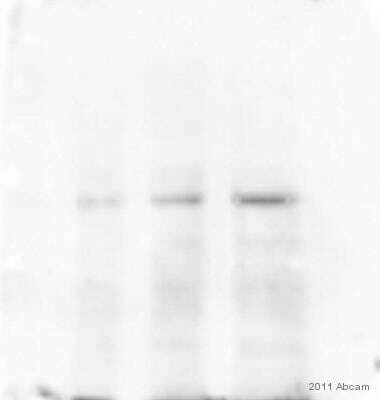 Abcam recommends using milk as the blocking agent when running western blots of ab80039. This blot was produced using a 10% Bis-tris gel under the MOPS buffer system. The gel was run at 200V for 50 minutes before being transferred onto a Nitrocellulose membrane at 30V for 70 minutes. The membrane was then blocked for an hour using 3% milk before being incubated with ab80039 overnight at 4°C. Antibody binding was detected using an anti-mouse antibody conjugated to HRP, and visualised using ECL development solution. 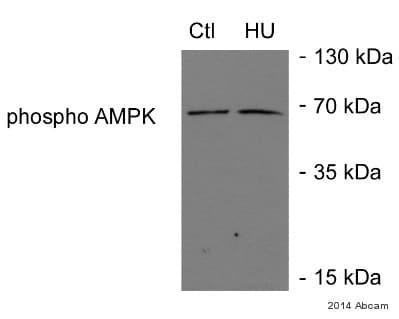 Western blot - Anti-AMPK alpha 1 + AMPK alpha 2 antibody [34.2] (ab80039)Image courtesy of Richelle Sopko, Harvard University, U.S.A.
Lane 1 : Lysate of 0-4 hour Drosophila embryos expressing control shRNA. Lane 2 : Lysate of 0-4 hour Drosophila embryos expressing SNF1A shRNA. 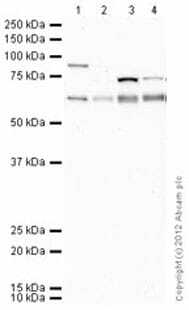 Customer want to use ab6006 as secondary antibody with ab110304 & ab80039 for chemiluminescence. Will ab6006 work as a secondary? ab6006 is a suitable secondary antibody for both ab80039 and ab110304. ab6006 detects the heavy and light chains of mouse IgG and IgM and IgA. ab80039 and ab110304 are both of the mouse IgG isotype. Can you please check if ab6006 is suitable for all the three below primary antibodies ? Application is WB. I can confirm that ab6006 is suitable for use with antibodies ab119484, ab80039 and ab110304. What is the major difference between ab51025 and ab80039? I can confirm that the two antibodies are very alike. They both are mouse monoclonal antibodies that were produced by using the same immunogen. But they are different clones and we do not know where exactly they bind in the 29 amino acid immunogen region.